Wear a lip balm with the highest SPF factor you can find when you’re out in the sun. Don’t forget to reapply after you eat or it has worn off. Keep your immune system strong by getting enough sleep, eating healthy, and manage stress though the many ways that are available to do so, i.e. meditation, exercise, yoga, breathing exercises, hypnosis, Tai Chi, relaxing while listening to spa-like music. If you still feel the dreaded early warning symptom of an outbreak, you can abort it instantly by applying a few drops of topical, herbal Cold Sores Begone™ to the area as soon as you feel the tingling sensation. The cold sore will not erupt, and you’ll be good to go. It’s a life saver, especially when you have something planned where your appearance will be important for you to feel attractive and confident. Cold Sores Begone™ has been recommended by PREVENTION and NATURAL HEALTH Magazines, and safe even for small children. It sells for $11, and available in selected health food stores, such as Whole Foods Market, Henry’s Marketplace, Sprouts, Mother’s Market & Kitchen and others. 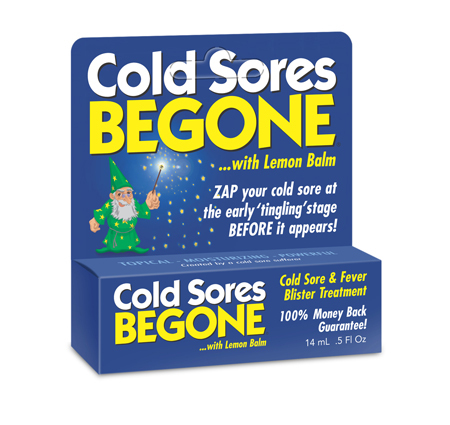 If it’s more convenient, Cold Sores Begone™ can be ordered by calling 888-877-6315, or online at http://www.csbegone.com, which ships out by the next business day for only $2.